Specifications: Product size: 110mm x 80mm x 40mm/4.3in x 3.1n x 1.6in package size:130mm x 100mm x 60mm/5.1in x 3.9in x 2.4in material: Steel and zinc alloy weight: 475g note: Please keep the key box closed for weather resistance. It's not recommend to use combination such as "a-a-a-a", otherwise it might be easily cracked. Please rotate the dials weekly to keep them work properly. Do not forget your own password, or you have no way to get it back. 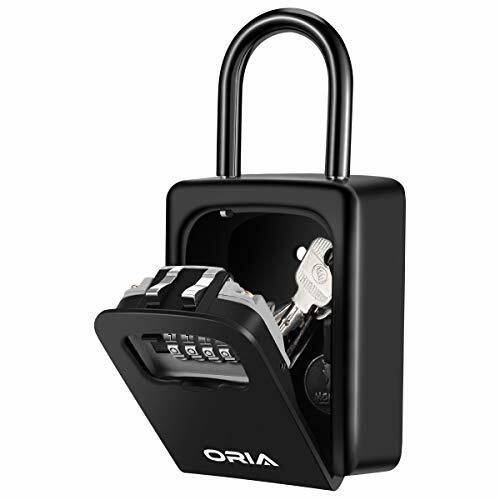 Package included: 1 x key password box 4 x screw 4 x expansion plug 1 x user manual warranty guarantee: - 24/7 customer service - 12-month replacement warranty - 60-day money back guarantee please contact us directly if need any help gcid: Oria. High Security: This product is an adjustable combinations lock with 4 dials. It can offer 10000 combination. 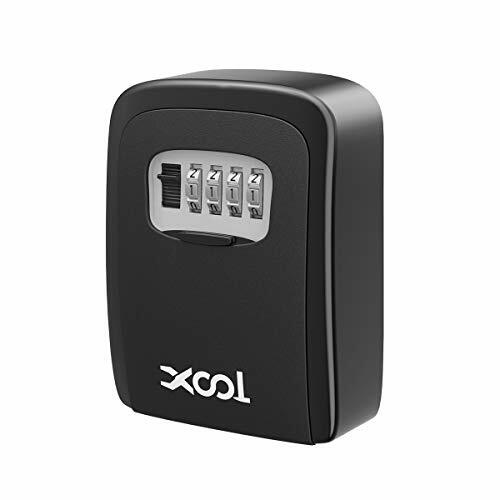 XOOL key lock box is perfect for outdoor or indoor. It is ideal for house, emergency entry, vacation home and office. The protective cover protects combination dials from unpredictable snow, ice, and rain. - Keep protective over closed to increase weather resistance. - We do not recommend use the combination such as "A-A-A-A" which is easy to crack. - Take a photo and keep it when you set your password.  HIGH SECURITY XOOL key lock box adopts hard aluminum alloy for durability and this metal material is rust-proof, waterproof and corrosion-resistant. High grade aluminum alloy will protect the box from hammering, sawing. The protective cover protects combination dials from unpredictable weather. The surface of key lock box is made of environmentally friendly material that is not harmful for humans or pets.  EASY TO USE Set the digits that you want as your passwords and the 4-digit combination is easy to remember and reset. XOOL key lock box will not get jammed in the process of operation for its fine workmanship. The key lock door is easy to open when you use the right combination. This key lock box is a resettable combinations lock with 4 dials and it can offer 10000 personalized combinations.  LOCK BOX APPLICATION XOOL key lock box is perfect for outdoor or indoor. It is best used for key or access card storage. Large space of lock box allows you to place 5 keys. If you would like to go to work or go on vacation but you don't want to carry your heavy keys. XOOL key lock box can take care of your keys for you. 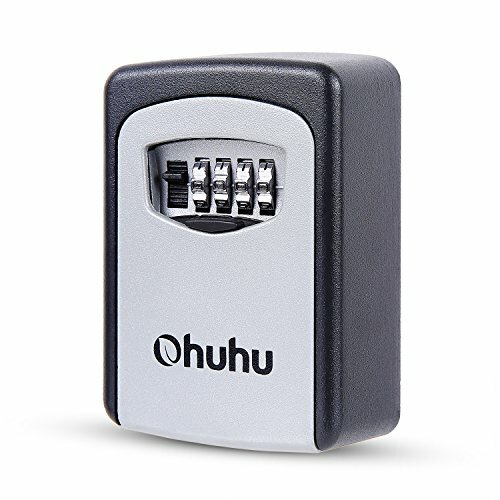 You are able to go to work or go on vacation without anxiety by using this key lock box.  PRACTICAL XOOL key lock box provides 8 free screws and expansion plugs that are used for fixing on the wall. The manual will offer you some useful guidance to use this product. By using the key lock box, you don't need to store your keys near the gate or under the items, which is extremely unsafe for your home. The password lock is ideal for house, emergency entry, vacation home, pet sitters, and office.  BEST GIFT XOOL key lock box has a simple and classical design. It will be an excellent gift for your family or friends. This key lock box is made of durable and high grade material, which makes it possible to use for a long time. The combination dial is very clear and easy to see. You can give your family or friends a key lock box to promote family unity or friendship. Brand: XOOL | Manufacturer: Shenzhen Baishichuangyou Technology co.ltd. 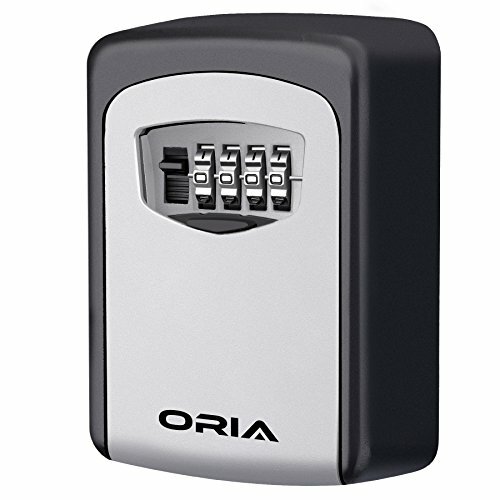 ORIA wall mounted key lock box with 4-digit combination can make your home accessible to trusted friends and family. It can provides 10000 combinations for you to choose. The box has large space which can be placed 5 keys at most. It is made of high zinc alloy material, which is stable and durable. It can prevent dust and rain into the box. Also it can resist cutting, hammering or prying. It is easy to set your own combinations. You install it on the wall and put your house keys or cars keys in it. It is convenient for emergency entry, vacation home, pet sitters ,etc. Specifications: Product size: 110mm*80mm*40mm/4.3in*3.1n*1.6in package size:130mm*100mm*60mm/5.1in*3.9in*2.4in material: Steel and zinc alloy weight: 475g note: 1. Please keep the key box closed for weather resistance. 2. It's not recommend to use combination such as "a-a-a-a", otherwise it might be easily cracked. 3. Please rotate the dials weekly to keep them work properly. 4. Do not forget your own password, or you have no way to get it back. Package included: 1 x key password box 4 x screw 4 x expansion plug 1 x user manual. Durable Material: This key lock box is made of zinc alloy and heavy-duty steel, which can protect the box from hammering, sawing or prying. Also, it is environmentally friendly paint, so it isn't harmful to the body. Large Storage Capacity: The box has large space which you can place 5 keys at most. You can put your house keys or car keys in it when you go to work or on vacation. Easy Operation: It is easy to install and use it. You can set your favorite numbers as your passwords. The 4-digit combination is easy to remember and reset. Wide Application: The key box can be used in many areas. It is suitable for outdoor use. It can be fixed to a wall for emergency entry, vacation home, pet sitters ,etc. 4.Close the door, realign the combination dials to lock the door and conceal your combination. 5.Close the weather cover. 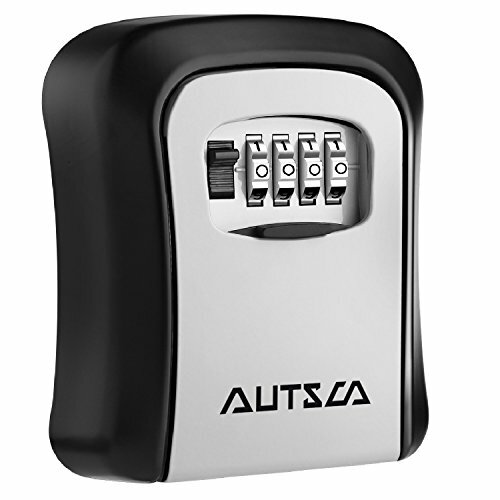 Sturdy Material Crafted from aluminium alloy, the Key Lock box is as secure as can be. It'll withstand hammering, sawing, prying, and other break-in attempts.These construction makes this lock box strong sturdy,durable,anti-rust. High Security it's easy to set your own four-digit combination. Just enter your chosen code for complete control over access to your keys. And because it offers up to 10,000 combination possibilities, this system is more secure than key locks, and it gives you the option of resetting the combination whenever you wish. 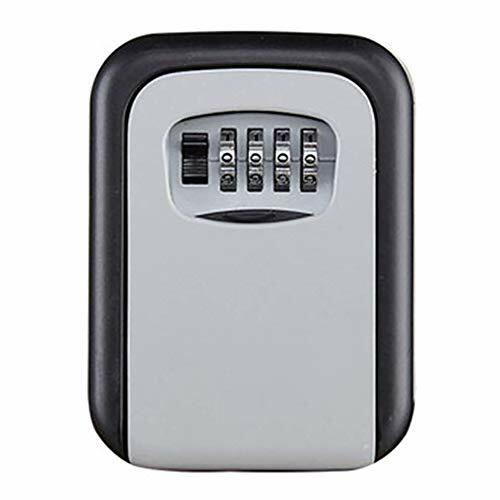 Large Capacity With a large storage space, this key lock box would store keys or access cards by your door securely.Lock box inside space is enough to storage up to 5 keys. Wide application The key box can be used in many areas. It is suitable for indoor and outdoor use.Portable lock box is best used for key and access card storage. It can be fixed to a wall for emergency entry. Package Included 1 x Key Storage Box 1 x Screw Kit 1 x User Manual(English). If you have any questions about our products. Please, contact us by contacting the seller and we will solve all your problems for you. If you are not satisfied with our products. We have a free replacement product or a full refund for our customers. 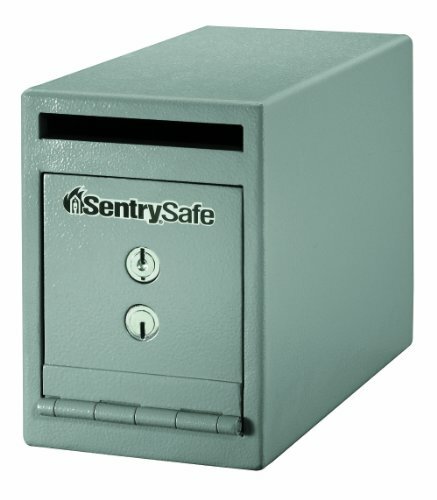 The SentrySafe Depository Safe is a must have for security conscious business managers. It's uniquely designed to protect cash receipts, deposit slips, keys and other valuables against theft and burglaries at the point of purchase. -Great for people who leave alone. Never worry about locking yourself outside your own house. Never worry about losing their keys. -Great for home services such as babysitters to access when we are not in. -Great for daily outdoor activities with keyless convenience such walking, bike-riding, etc. 1.We do not recommend use the combination such as"2-2-2-2"which is easy to crack. 2.It is recommended the dials are rotated weekly to keep safe key lock box holder hider moving freely. 3. DO NOT forget your own password, or you have no way to get it back. 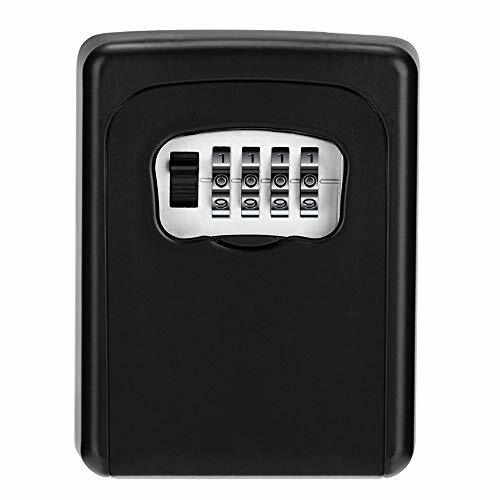 High Security 4 digit combination lock box allows you to set your own combo code with 10000 unique choices. There is no need to hide your keys under the carpet, flowerpot, or mat. Just tell the password to your friends who allowed get into your house. Removable Shackle It is easy to install and use. You can set the password you like. The 4-digit combination is easy to remember and reset. Lock box with a removable shackle that you can hang it to different door knob or anywhere you like, or mount it on the wall. Large Capacity The box has a large space and can hold up to 5 keys. You can also alter to storage a car key, credit card, USB thumb drive and so on. Following the instruction to reset the 4-digit combination code is easy to follow. Durable Material High strength zinc alloy body and hardened-steel shackles, offer extra resistance to cutting and sawing. It is harmless to the human body. It is rust resistant, sturdy and a reliable key safe box. Wide Application The key box can be used in many areas. Suitable for indoor or outdoor use like doorknob, metal fence, railing, emergency entry, vacation home, pet sitters, etc. No tools needed. Don't hide your keys underneath your doormat in a flowerpot-keep them safe and secure in the Ohuhu Key Safe Box! This state-of-the-art lockbox keeps your keys and other valuables protected. Its ultra-strong construction withstands hammering sawing, keeping thieves at bay. A four number dial provides up to 10,000 unique combinations, maximizing security and eliminating the risk of lucky guesses. Use this safe to store your keys and other small items. It's great to use for emergency entry, vacation home, pet sitters or wherever else you may need it. Nylon expanding wall anchors can be used to screw the safe onto a floor or any other hard surface. - Keep the lockbox closed at all times. - We recommend avoiding combinations such as "0-0-0-0". For best security, choose a combination that is difficult to crack. - Rotate the dials weekly to maximize their lifespan. - DO NOT forget your combination code. This lockbox cannot be opened without the proper code.  EASY-BREEZY INSTALLATION: Install your safe in no time flat! Simply insert the included screws, drill them to the wall or other hard surface, and make sure it's tight. Nylon expanding wall anchors make drill on any solid surface possible.  WIDELY USED: It can be fixed to the wall for emergency entry, vacation home, pet sitters or wherever else you may need it.  LARGE STORAGE CAPACITY: Keep all of your valuables in one place! Thanks to the generous storage capacity, you'll be able to fit at least 5 keys, USB, and so much more.  THE ULTIMATE THIEF DETERRENT: Crafted from premium zinc alloy and heavy-duty steel, the Ohuhu Key Lock box is as secure as can be. It'll withstand hammering, sawing, prying, and other break-in attempts. You'll be able to use it for years to come!  ULTRA SAFE: Your valuables are safe with us. The four dial lock offers up to 10,000 different combinations, far more than three dial models. Your code will belong to you and you alone. DuraBox W500 wall-mount letter size drop box with tubular key provides secure all-day storage for valuable or private items like money, checks, car keys, and mail. Keep important things locked away and protected from theft. The perfect solution for when in-person exchanges become impractical or impossible; pick up items at your leisure. For indoor use only. The W500 wall-mount drop box features a piano hinge reinforced double steel door to prevent prying. Metal baffle inside the drop opening protects against fishing. Includes a pair of tubular keys that are harder to duplicate than standard keys for added security. Durable steel construction provides secure all-day depositing of valuable or private items such as cash, checks, car keys, remotes, small envelopes, and more. Designed to be mounted on a wall, Mounting hardware included for wood and concrete. Deposit slot opening is 9-1/2 wide and accomodates items up to 7/8 thick. FOR INDOOR USE ONLY: This unit is not rain/water proof and also not ideal for receiving large mail items such as books, magazines, catalogs, booklets, manila envelopes, and other larger mail. Mountable Cash Drop Box with Tamper-Proof Slot. Great as a Key Depository Or Deposit Safe for Hotels, Apartments Or Retail. Highly Secure Thick Steel and Key Lock! Pre-Drilled for Easy Wall Mounting! 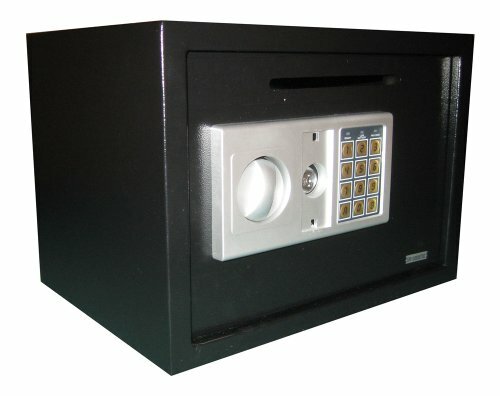 ULTRA SECURE, EASY TO MOUNT LOCKING CASH SAFE WITH DROP SLOT. 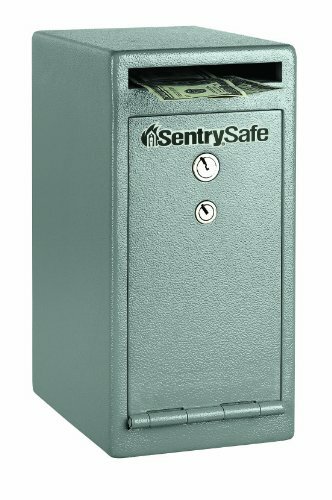 This deposit safe keeps your checks, cash and keys safe from thieves even when you're not around. Conveniently accept payments from your tenants at any hour! 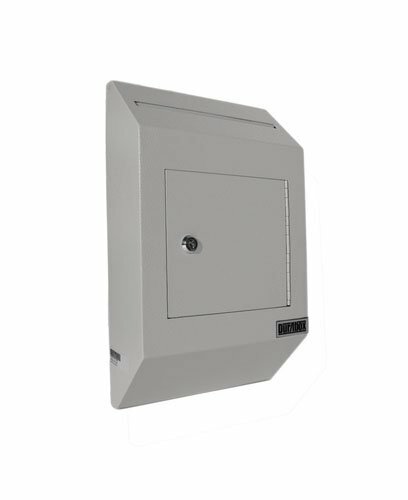 The cash drop safe box comes with mounting holes on every side, so you can mount it just about anywhere! Does this money safe have a lock included? Yes, and it's built-in! The 5.5 in by 6 inch door is locked with a 2mm steel bar that locks with a key. The cash box hinge is nearly indestructible, and the tamper-proof blade under the .5 drop slot is hearty 2mm thick steel as well. The cash deposit box comes with 3 keys for the lock. How big is this deposit slot safe? Is it conceable? The safe is .25 cubic feet, measuring 6 tall by 6 in wide and is 12 deep. 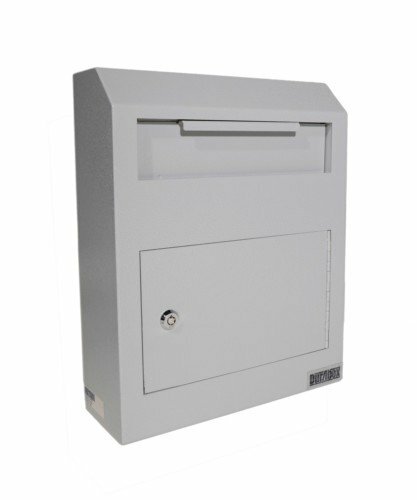 The 6x6 front face of the depository safe with drop slot is easily concealable in a wall, floor or counter. Will I need mounting hardware? The cash drop box with slot does not include mounting hardware. Depending on what surface you plan to mount your safe, you will need different types of anchors or screws. The pre-drilled mounting holes are 3mm wide to accommodate a variety of anchors. Lifetime Money-Back Satisfaction Guarantee! If you aren't completely satisfied with your order, simply reach out to us through the Amazon messaging service and we will respond within 24 hours to make it right even on the weekends. We absolutely guarantee your satisfaction or your money back! DON'T STAY UP ALL NIGHT WAITING FOR RENT. With this check drop box, you won't have to work the graveyard shift to get your hotel keys or rent checks from your tenants after hours. MAXIMUM SECURITY = PEACE OF MIND. With its thick 2mm steel walls, pry-resistant hinge and tamper-proof blade under the deposit slot, this cashbox safe will keep your valuables securely. LIFETIME MONEY BACK GUARANTEE! We stand behind our cash deposit safe and all of our products. If you're not 100% COMPLETELY SATISFIED, just send us an email, and we promise to make it right! EASY TO MOUNT ON ANY SIDE. 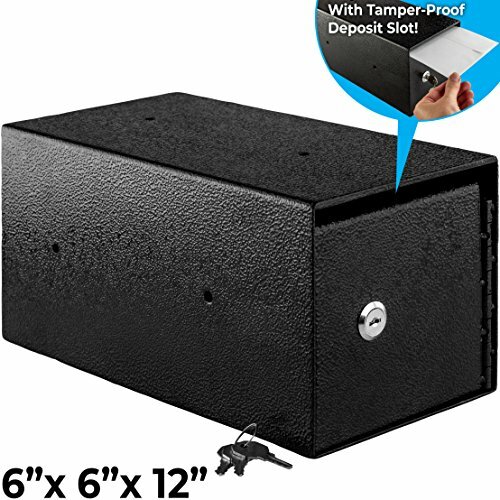 Pre-drilled holes make this 6x6x12 mountable safe a versatile between studs wall safe, hidden floor safe or under-the-counter cash drop box for retail - it's up to you! DON'T GET LOCKED OUT! No dead batteries or electrical failures will keep you from your valuables. Keyed safes are still the most tried-and-true way to lock up your cash. Three keys are included. Digital entry. Master key included in the event of forgotten or lost codes. 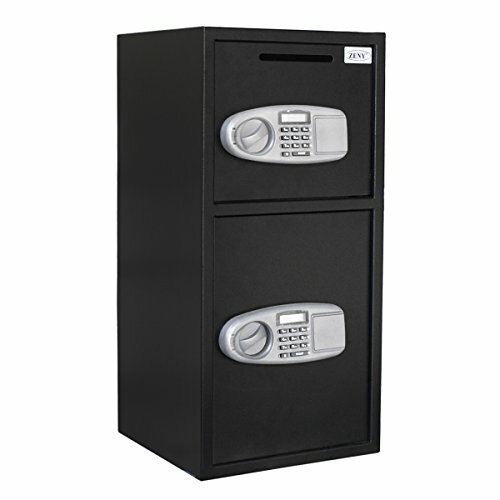 Designed for Added Security-- Includes 2 separate safes for added security, opens with secret PIN code or included keys. Provided with an anti-fish hopper which does not allow hands to be put in it to take money out. Runs on AA SIZE(1.5V) batteries, batteries NOT includede, CODE can be changed infinitely. 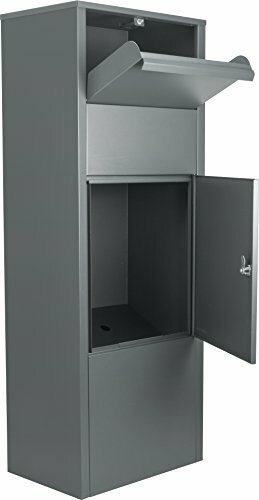 ThisMetal Freestanding Wall mount Parcel Lockable Drop Slot Mail Box provides a secure way of locking up important items such as large envelopes, packages, and more. The top slot of this Parcel Drop Box accepts items up to 13 inches in width by 6 inches in height, and can be mounted directly to the floor using the included mounting hardware. 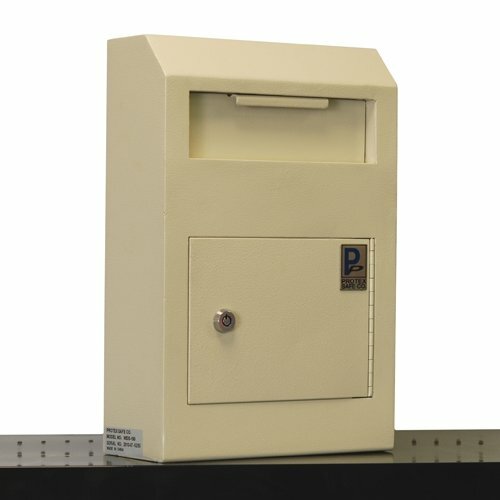 This Winbest Steel Freestanding Floor Lockable Drop Slot Mail Box with Parcel Compartment can be mounted directly to the floor in front of your home using the included mounting hardware. DuraBox W300 letter size wall drop box with tubular key provides secure all-day storage for valuable or private items like money, checks, and mail. Keep important things locked away and protected from theft. The perfect solution for when in-person exchanges become impractical or impossible; pick up items at your leisure. Best suited for indoor use. The W300 wall-mount drop box features a piano hinge reinforced double steel door to prevent prying. Metal baffle inside the drop opening protects against fishing. Includes a pair of tubular keys that are harder to duplicate than standard keys for added security. 8-3/4" wide opening fits letter size envelopes. Pre-drilled holes on the back of the drop box align with the door opening for better tool access and easier wall mounting. Accommodates drop items up to 1/2" thick. Drop Opening: 8-3/4" W x 1/2"
Our brand new digital double door safe box. This is the best safe box to helpyou store your item. It is built with a heavy duty steel construction, thisunit can keep cash, jewelry, guns, documents and other valuables safe. 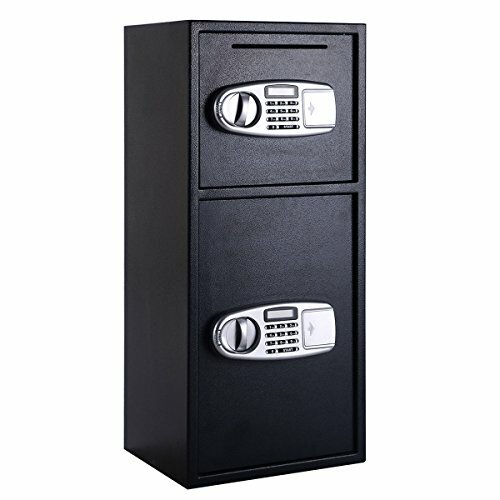 Thisdigital double door safe box is an excellent choice for convenience office,home, stores, restaurants, motels, churches or any type of business that usescash transactions. Thoughtful Emergency Keys-- Two doors all have digital double door. Accidents would always happen, such as if you forget your password or in some conditions, you need a emergency key to open the door. This item comes with 4 emergency keys which could give you another safety protection . Digital Double Door-- It is built with a heavy duty steel construction, this unit can keep cash, jewelry, guns, documents and other valuables safe. This digital double door safe box is an excellent choice for convenience office, home, stores, restaurants, motels, churches or any type of business that uses cash transactions. Large and Classify Storage Space-- Two separated box with digital lock which could used to put different types of items. 100% Satisfaction Guaranteed--We would try our best to give you satisfied shopping experience, if there is quality, we would make best solution to solve the problem. If you're still hiding your spare keys under the doormat, it's time for a better, more secure solution. Trust worthy and secure, the KIPRUN Lock Key Safe Box offers a convenient locking solution that holds up to 6 house or car keys. You'll always know exactly where your keys are. It's also a smart choice for families with children who may need to enter the house when an adult isn't present. 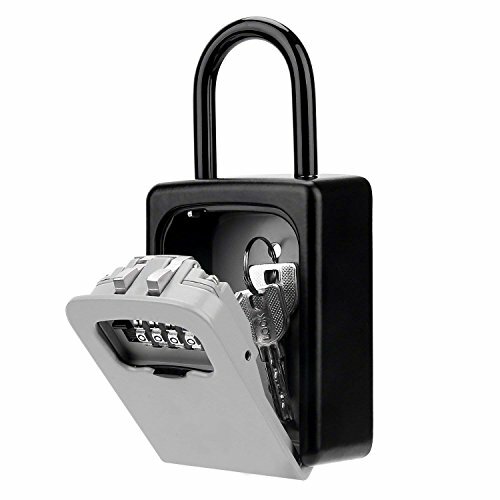 The KIPRUN Lock Key Safe Box boasts durable die-cast zinc construction with vinyl-covered shackles to prevent scratching. What's more, its reinforced, molded body is built to last and helps to withstand hammering and sawing. Specifically, a shutter door protects the combination dials from weather, dirt, and grime, so the result is rust-free performance and long life. With the KIPRUN Lock Key Safe Box, it's easy to set your own four-digit combination. It offer up to 10,000 combination possibilities, more secure than key locks, give you the option of resetting the combination whenever you wish. Durable material: This key lock box is made of high strength zinc alloy and heavy-duty steel, which can protect the box from being damaged by hammer, saw, drill and so on. vinyl coated shackle to prevent scratching, and shutter door to protect combination dials from weather,waterproof and anti-rust. Larger storage capacity: Outer dimensions: 4.72 x 3.35 x 1.57. The key box has larger space which you can place 6 keys at most,more storage than conventional lockboxes. You can put your house keys or car keys in it when you go to work or on vacation. Easy operation: It is easy to install and use it. Install with pre-drilled holes is super easy. Resettable 4 digit combination for keyless convenience, set and reset your combination allowing thousands of personalized combination code options. You can set your favorite numbers as your passwords. Protex safe Co. Has the most versatile line of drop boxes in the market. Our drop boxes are both affordable and visually attractive. We take pride in the fact that all of our unique drop boxes are designed here at our corporate office in los Angeles, CA. When security comes to mind, we emphasize on security and Ease-of-Use when designing a drop box. We use only the best materials and techniques available when constructing our drop boxes. Warranty: 1 Year Limited. Parts only. -Great for people who leave alone. Never worry locking yourself outside your own house. -Great for family, relatives, friends and latchkids. Never worry they arrive earlier than you or loose their keys. -Great for home services such nannies, dogwalkers, babysitters to access when we are not in. -Great for daily outdoor activities with keyless convenience such walking, bike-riding, etc. -And a lifesaver lock box to make elderly parents accessible to emergency responders. Not only for outdoor key storage, the lock box is also perfect to store small valuable items like a spare card key, USB thumb drive, credit card, etc. You can mount it anywhere hidden as you need. Please keep the shutter door closed for weather, dirt and grime resistance. It is recommended that the dials are rotated weekly to keep them work properly. DO NOT forget your own password, or you have no way to get it back. 2. Inner Dimension: 3.54in x 2.64in x 1.38in (L*W*H). Each of our key code box is carefully selected and double checked before shipping. We offer 12 months warranty. If any chance you are not 100% satisfied with the quality of our key storage box, please contact us for a prompt refund or free replacement. Simply reply about the issue to the shipping email that you will have received from us. We will come back to your ASAP within 24 hours. Convenient: Keep a spare key handy and never nerve to lock yourself out. The key box is perfect for people living alone, friends, relatives and latchkey kids, home sevices at given time, emergency entry, real estate business, etc. High Security: The 4-digit combination lock box allows you to set your own combo code with 10000 unique choices which you know it is secure. 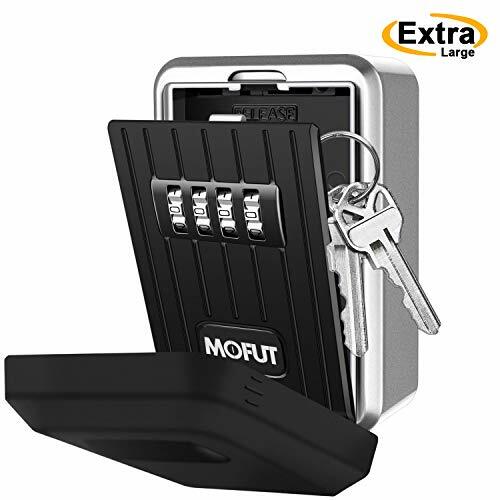 High strength zinc alloy body construction mounted inside with 4 heavy duty mounting screws, protects the key safe box from hammering, sawing and prying. Easy Operation: Open the key lock box with correct combo within 2 seconds, saving time to search keys in your bag. It is easy to install and set the 4-digit combiantion. Instructions are always included. Large Capacity: The key storage box comes with large internal space holding up to 5 keys. You can also alter to storage a car key, credit card or USB thumb drive. Inner dimension: 3.54in x 2.64in x 1.38in (L*W*H). Exquisite Design: Key box wall mount designed for installation to a wall or other fixed object; sliding shutter door to hide as well as protect combination dials from weather; sturdy metal body construction for durability; environmental protection paint is non-corrosive and rust-resistant. Durable Material: This key lock box is made of zinc alloy and heavy-duty steel, which can protect the box from hammering, sawing or prying. Also, it is environmentally friendly paint, so it isn't harmful to the body. High Security: This product is an adjustable combinations lock with 4 dials. It can offer 10000 combination. With rust-resistance Aluminium alloy material, this key safe box is made to withstand hammering, sawing and prying. The combination key box has a large internal cavity that allows safe storage for over 5 house keys. Resettable 4-digit combination can make more than 10,000 of your own key cabinet access code. 4 screws, 4 plastic expanded plugs and 1 long screw included to ensure the key lock box firmly fixed on the wall or door peephole. 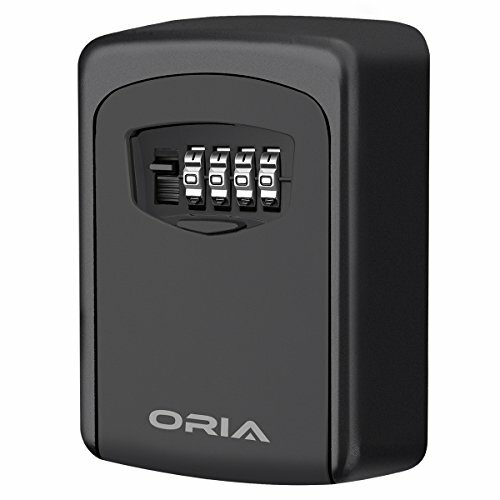 Suitable for storing and managing keys for homes, offices, gyms, factories, construction sites, etc. 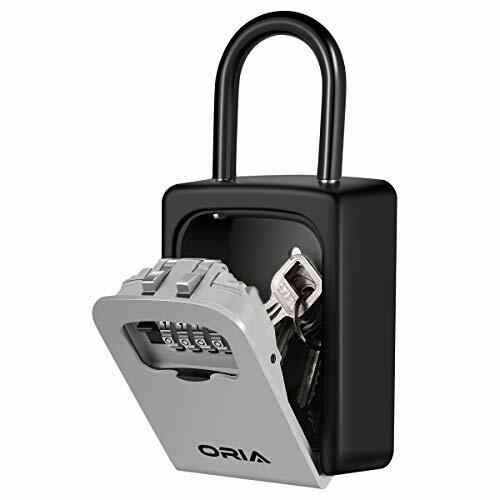 Durable Material: The key lock box is made of a high strength zinc alloy, solid steel and resists crushing, sawing and prying. Our exterior key safe protects from dust, rust, sunlight, rain and snow with its removable rubber cover. 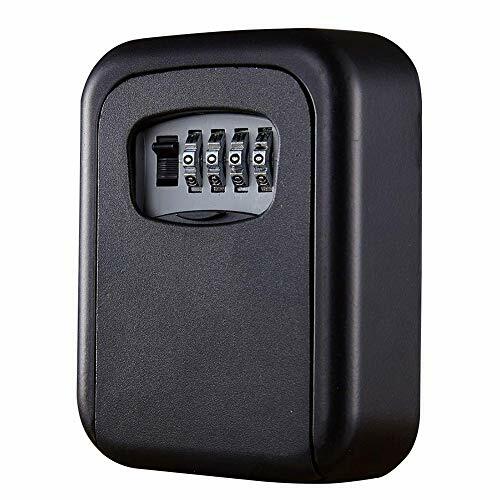 Adjustable 4-Digit Combination: The secure key safe box provides you a 4-digit code with total of 10,000 combinations for optimal protection. It is best to reset it and set your own combination when you receive it (original code 0-0-0-0). IMPORTANT Do not forget your password, or you have no way to open the key box. Secure Home Access: Avoid lockout and provide keys to brokers, contractors, family members and tenants. You don't need to place the keys under the carpet or flower pot. The key keeper with numeric code helps you save time and protect yourself without the risk of loss or theft. Easy Installation: The necessary mounting hardware consisting of 4 screws and 4 nylon expansion dowels ensure the key lock box can be mounted on any solid surface of companies, classrooms, holiday homes, apartment entrances and homes. This is great for people who travel a lot and do not want to lock themselves out anymore. 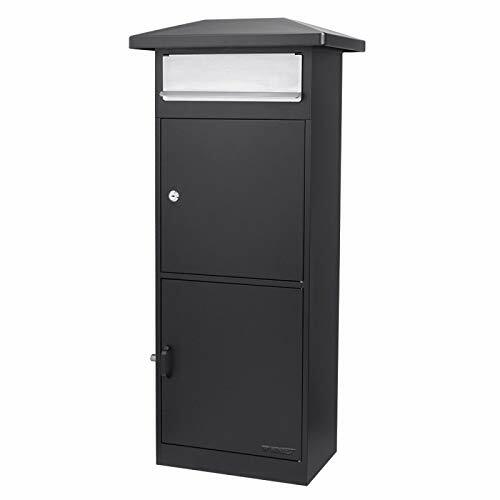 The Winbest Steel Freestanding Floor Lockable Large Drop Slot Mail Box with Parcel Compartment, Black provides an effective and secure way for delivery services to safely deliver important mail and packages. The wide stainless steel deposit slot located on top of the lock box allows delivery personnel to drop off important packages into the locked compartment, which can then be picked up later by authorized users with key access. Winbest Parcel Boxes are perfect for any home, and includes with the necessary hardware to mount securely into place. 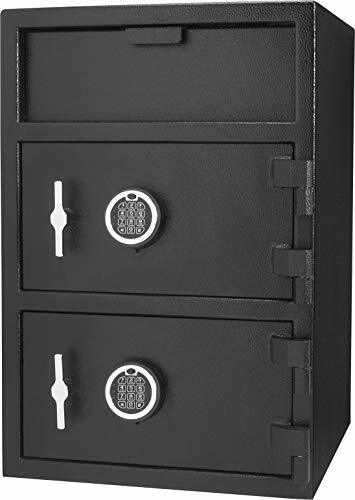 This Steel Depository Safe Front Loading Drop Slot Parcel Mail Safe with Locker Dual Electronic Lock is Pre-drilled mounting holes on the bottom of this large Deposit Safe permits mounting with the included hardware. Multi-Purpose - 9.5"x 6.5"x 1.75" Lock Box provides secure storage for handguns, jewelry, cash, medications, passports, tablets and in the car or when traveling. Keyed Locking System - A zinc alloy combo lock and no batteries required; Safe is great for holding valuables like ammo, small firearms, jewelry, cash, or personal documents. Scratch Protection - Includes four thick protective foam inserts to ensure security and protect your valuables from scratching or damage.